Preheat oven to 350°. Place a large pot of salted water on to boil. Stir in the pasta and cook until just tender. Drain, toss with a small amount of the olive oil and keep warm. Heat the remaining olive oil in a large sauté pan over medium heat. Add the shrimp and cook 2-3 minutes on each side. Stir in the onion and sauté, stirring constantly, for 3-5 minutes. Stir in the garlic and cook 1 minute more. Deglaze the pan with the wine, and stir in the tomatoes, radicchio, oregano and feta cheese; simmer together until the shrimp are just cooked, about 30 seconds. 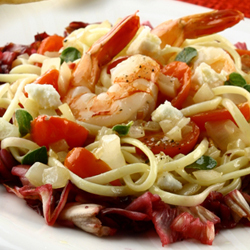 Toss pasta with shrimp mixture and serve.